four signatures plus the journal covers. it has almost arrived at its overseas destination already! the journal in it's entirety looks a bit like this. 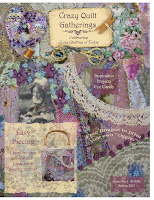 and view more of my journals, collages, clutches, cards. etc. Suzy this spring blooms journal is gorgeous. Such lovely colours and fabrics. This is so very beautiful Suzy! 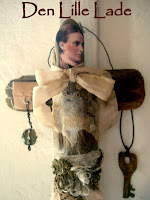 You seem to have just the right touch when it comes to your journal creations! 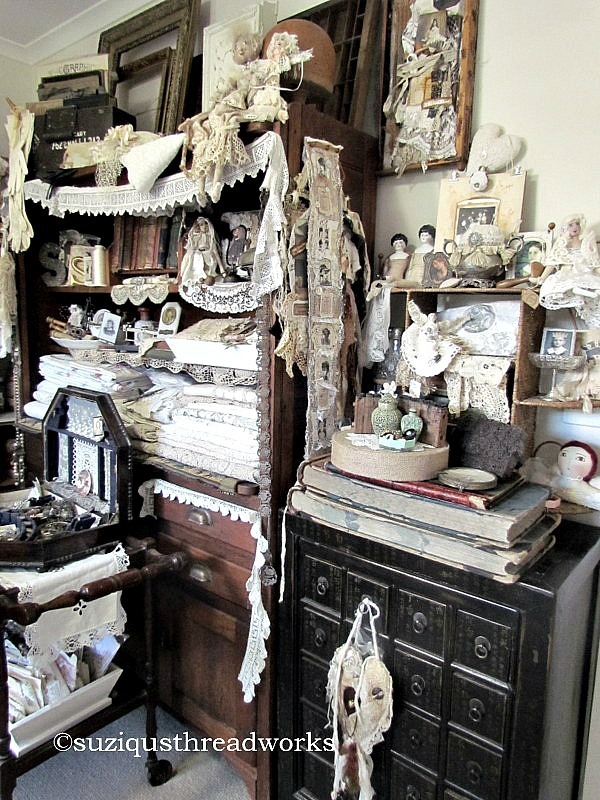 I would love to make something in this style....vintage and dreamy, but I look at yours and others like them throughout the Web and seem to hit the brick wall! I just can't seem to see where to start, with what and how to put it all together at all. Do you find it easy to work all this out in your mind? Or do you just start and then you have a finished lovely in your hands!? Sorry about the quizzing. I suppose a class of some sort would get me started. I'll have to go searching. WOW! This is absolutely beautiful,Suzi! Just stunning. You are the queen of fabric books. I can see why it was snapped up so quick! As usual, you didn't let us down on the WOW! factor LOL! I can image the new owners'face and trepidation (if that's the right word), as they open the parcel containing this fabulous journal.......I wouldn't be able to put it down, possibley not even write in it! Thank you for your wonderful talent in bringing such beauty to share with us. 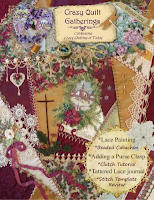 This book is full of beautiful images, laces and texture! So gorgeous! I am sure whoever gets it will cherish such a work of art! Absolutely exquisite Suzi! Lucky gal who bought it!!! I love viewing your things and letting my mind drift to thoughts of you constructing these art pieces. You call it Spring Blooms...I call it Exquisite. No wonder it was claimed! Your pre-raphelite images are beautiful as are the combination of fabrics and textures you've used. I want one girlfriend!!!! Wow Suzi, this one is wonderful. I also admire all those lovely photos. Another beautiful journal. This is one of my favorites. I love all the colors in it. Stunning. It is incredibly wonderful- one just want to touch it and finger all the intricate bits- a master piece! Hi my sweet Suzy, what can I say.... I have no words to fully explain what beauty I see, no rich english language enough to express what I feel, seing this stunning art piece of yours. All the many gorgeous materials you mix and the beautiful images you use, your way of making it look like a coincidence how you add this or that- you are the bearer of an artist heart, and know how to express it in the most stunning way. This journal is amazing dear sweet friend-and the new owner I`m sure is singing every day, ever since she recieved her treasure. Suzy I can see why that gorgeous journal was spoken for right away! The color combinations just took my breath away! Really amazing work Suzy! 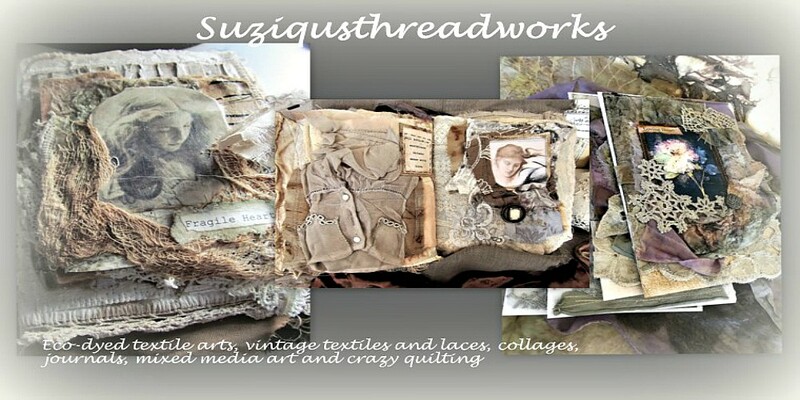 Suzy, I absolutely adore the deep and subtle shadings on the page with the embellishments. Do you paint them with various colors, or how to achieve that? I just love it. Someone is very lucky! Love love love this journal!!! Your work is wonderful! Have a great day and enjoy the weekend. No wonder Suzy that this journal was sold before it was ready. It looks fabulous, as always! I read often and write less, just because i'm mostly out of words. Your fabric books are so beautiful and phenomenal, just like some kind .. made by hands of fairys. You see, i can't use normal words for this ravishing beauty. This book is ADORABLE. I love fabric and sewing, so I feel fortunate to have been able to have seen this gorgeous book. 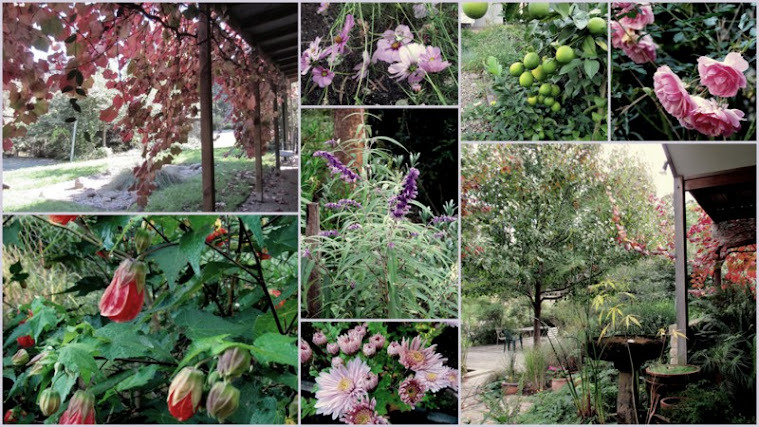 Thanks for the visit, so it led me back to your gorgeous blog. Now I plan to spend more time here. Your books always have the most wonderful textures!! I just want to reach out and touch them all! This one is no exception Suzie! The colors, the fabrics and lace... just delicious!! this is realy a fabulous and gorgeous journal. so many different layers, details, lace and fabric and a wonderful mix from colors. have a nice sunday and hugs! "Someone" is vey lucky to have purchased THIS, Suzy! It's beautiful! My favorite photo is the pearl button with the sheer embroidery just twining up with the tiny rose on it! So delicate!!! Happy Fall to you! That sounds so odd to me, as we're just into spring! 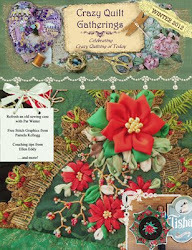 Dear Suzy your spring blooms journal is so wonderfully made with all the different lace, your pages created with the embellisher looks so soft and lovely, love your work, your blog is so inspiring to visit. Suzy you never cease to amaze me. Every book you create is a thing of beauty!!! Congrats on being featured on Art-e-zine. Love that sute! Hi Suzy! OMG that is an exquisite hand-piece. Glad you came for the Cottage Garden Party! Your journals and other works of art are breathtaking! I just love coming to visit and just seeing what's new, and to see what I've missed. Your talent is amazing Suzy! Thank you so much for sharing this work with all of us!! I cannot stop touching it LoL everytime I walk by it I have to pick it up and open it...sew tactile & beautiful & inspiring...love-love-love it!!! What a beautiful, beautiful book Suzy! The roses are just perfection and your detail is something else. I keep looking at my collage and marvel at how you put these things together - just so gorgeous! 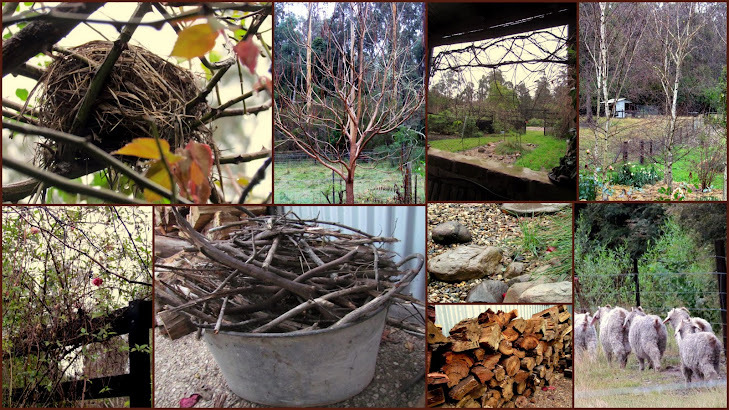 I hope you have a warm and inspiring Autumn ahead... we are in the midst of a cold and wet Spring! 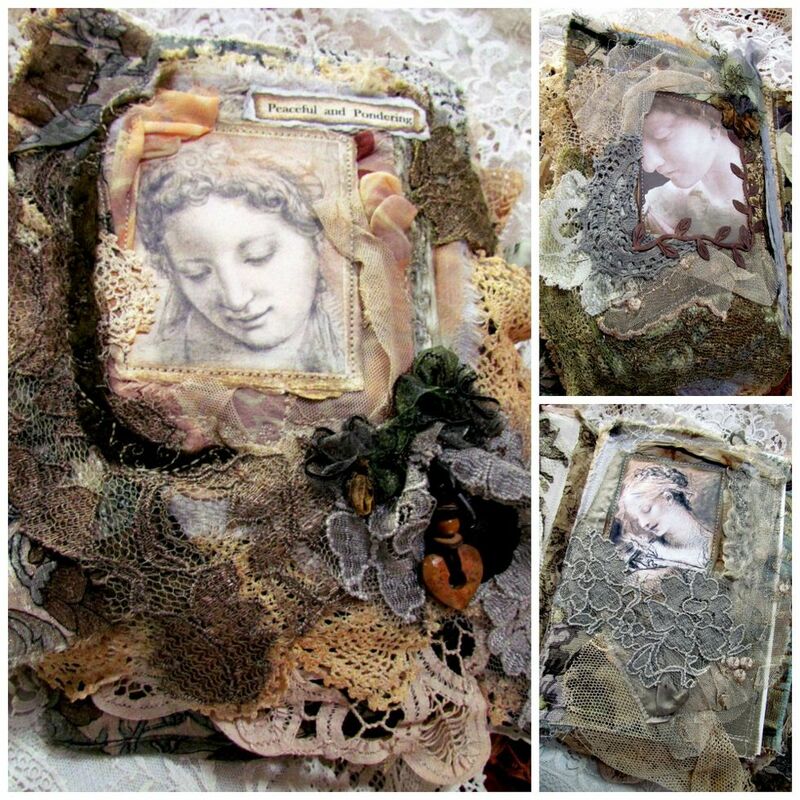 It must take you hours and hours to create these stunning journal masterpieces. They are so exquisite! I love autumn...we are just now having a heat wave in the middle of our spring. It will cool down again, but then the heat will be here to stay for about four months. I can't even express how beautiful I think this journal is Suzy! Every time I see one of your art pieces, I think they cannot get prettier, but they do...maybe not prettier, but lovelier in a different way. 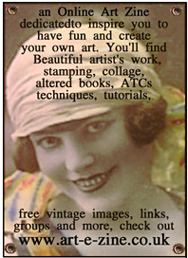 Isn't that what is exciting about collaging? Every thing is a surprise of beauty. Especially yours!!! I love the images you used in this journal. I went to your Etsy shoppe and saw the amazing rose quilt. 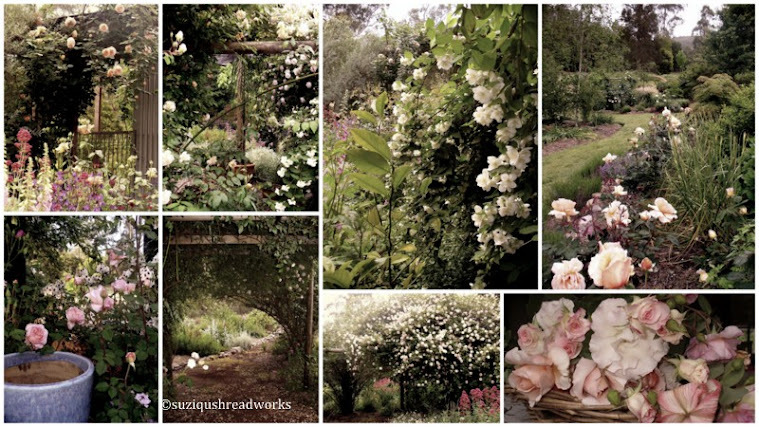 It is a garden of the loveliest roses ever...just like I imagine your own garden!!!! GORGEOUS!!! I will never be able to quilt that beautifully, but I am really loving every minute of it. 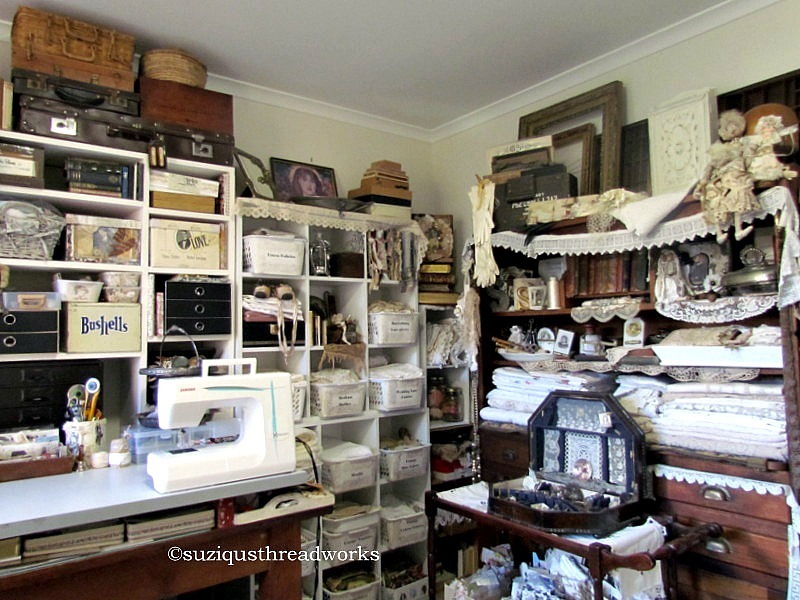 I just had a lot of my family home this week and could see the need for many more quilts in the house. I had three daughters and their children here and all of the children slept on the floor and we really had to scramble to find enough bedding for them all. I can't wait to get these done. Thank you for your visit sweet friend. I always feel as though we are just chatting away over a cup. oh my goodness! what a gorgeous book! this is just too lovely for words...I can actually feel the textiles in your photos! amazing work as always - you are always soooo inspiring! Spring Blooms is the most divine book - Congratulations to whoever bought it!! A piece of your heart is in this Suzy and it shows all the way through. ...and I love that it's so tactile and made of many beautiful natural fabrics - I COVET that slubby linen tie on the side!!! You're a legend mon ami (and such a gracious one at that)!!!! I wholeheartedly agree with everything already written about this amazing journal. Ohh and ahhh, three times over! This spring blooms journal is a feast for the eyes my dear. I would love to hold this beauty in my hands and take in all the lil details...your talent is amazing Suzy. Suzy , thank you for the nice comment about my mosaic . Your journal is so romantic , love it so much !! "katerunner" on her flickrsite Kate thompson . You know my English is very bad !! oh suzy...you have the touch of Love's heart and soul, to create such a luscious display of spring's beauty in every fiber and fusion of color. what a magnificent creation...and i'm sure the recipient is blessed beyond words. such beautiful images to remember each detail. and what a lovely comment you left on my post dearest. truly you have pieces of my heart as well. Your latest creation is just beyond beautiful. That pale pink rosette is just fabulous - the textures - I would love to just finger my way through this beautiful book! Thank you for featuring my little give away. I'm so sorry to be so late to come and thank you - we have been on travels - again! As always ...such glorious creations you make! There is just something so rich and rare when I see one of your fabric journals...they are more than Victorian, they seem to overlap the romantic era and the Renaissance period. Scrumptiously divine! FABULOUS, dear Suzy! What a stunning journal!!! Such a beauty!! The journal is awesome. So many layers, farbrics and embellishements!